I had been looking forward to Mort out of all the Discworld novels, because then I would finally meet Death properly. 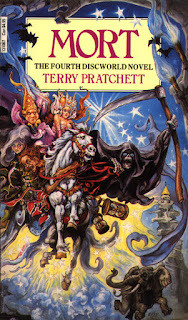 I haven't watched all of the Discworld screen adaptations, but I vividly remember my best friend putting the adaptation of Soul Music on and I was intrigued by what I saw of Death and his strange family. How much of that was down to the perfect casting of Christopher Lee I don't know, but from the moment I actually read some of Pratchett's work, I was most looking forward to reading about Death. It was what made the eye-searingly ugly front covers bearable at any rate. Mort follows a young man named Mort, oddly enough, who finds himself starting a very strange apprenticeship. After being sent to the job market by a father desperate to find him a trade to flourish in, Mort is chosen by Death to be his apprentice, to help usher the souls of the dead into the afterlife and possibly be company for his adopted human daughter, Ysabel. On his first night solo, however, Mort finds that he cannot bring himself to kill a young princess, leaving her alive in a world that is determined to believe that she is dead. I know that I'm only four books into the series at the moment, but Mort is definitely my favourite so far. As expected, the humour is brilliant, with a nice sprinkling of some appropriately black humour considering the subject matter, and the highlights are as always the little side notes that Pratchett throws out throughout the narrative. I got some odd looks on the bus, which is always a sign of quality for me anyway. The main character Mort was perhaps a little on the generic side for me, but there was an interesting transition from awkward teenager who is all knees and elbows to a would-be personification of Death (I'm not sure whether the anthropomorphic part of the title fits in his case) that felt both natural and appropriately eerie, which I wasn't expecting. I would have like to see more of Ysabel, because there's something incredibly endearing about a teenage girl who has maybe had one too many sweets trying so hard to emulate all the willowy tragic romantic heroines that she's read about in her father's library. My favourites by far though were Death and, much to my surprise, Albert. Death I was expecting to like, because there's something wonderful about the anthropomorphic personification of Death trying to understand what life is like. It's fantastic to see him experimenting with things that humans are supposed to like and being left more confused than ever because there seems to be no purpose to them. Albert though. I love Albert's moment in the spotlight when he returns to the world of the living, remembers what life and power feels like, and promptly falls back into the life of a crotchety, petty tyrant. It's brilliant and ridiculous and faintly rubbish even when he is causing chaos at the Unseen University. I am really looking forward to seeing those two again in later books. The plot is perhaps a little weaker, with the stakes feeling a bit underwhelming right until the end. I mean, it's one human life compared to quite a few that are snuffed out over the course of the narrative. But then I suppose teenage crushes don't necessarily take the pressures of fate into consideration, so it does sort of work.